With a sleek contemporary design, constructed of a soft, supple padded seat. 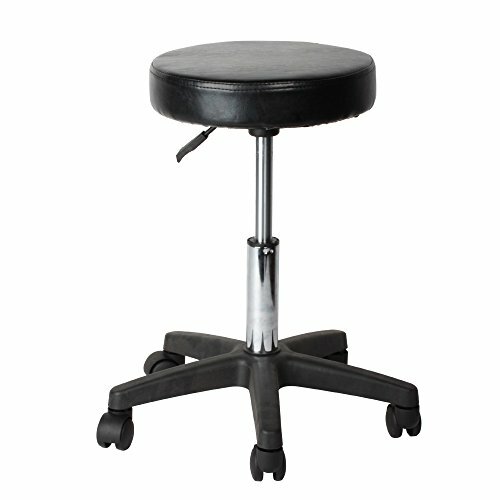 Getting a good, simple stool under you is one of the best ways to make your day at the salon or the office easier and softer. The hydraulic base can raise the height from 1 1/2 feet to 2 feet so you can adjust to whatever manicure table or facial bed you might be working at. It stays steady on a five star base with smooth rolling wheels so it can keep you comfy wherever you need to go. It is perfect for Reiki therapy, massage, tattoo, doctors, dentists and other practitioners. Adjustable height: 43cm / 17" to 56cm / 22"
Diameter of seat: 33cm / 13"